This layer is also accessible from the Volumes view: On the Menu bar, click View > Volumes to open the Volumes. The Layers section is displayed on the left of the main window. The Volumes view is available when the point cloud and the DSM are generated. The Display Properties of the triangle meshes can be changed in the rayCloud and the Volumes. When they are changed in one view, they will be inherited in the other view. The Triangle Meshes layer can display a 3D Textured Mesh. By default, the 3D Textured Mesh (if generated) is not loaded in the 3D view. By selecting/unselecting the Triangle Mesh checkbox, the corresponding triangle mesh is shown/hidden in the 3D view. It displays a 2.5D triangle mesh, in the right position if it is a Pix4Dmapper file or external file in the same coordinate system as the output coordinate system selected in Pix4Dmapper. Warning: DO NOT drag and drop a point cloud to generate the Triangle Mesh while a project is processing; processing may stop. Once step 2. Point Cloud and Mesh is completed, when reopening a project, or when a triangle mesh has been uploaded, the Triangle Meshes are not loaded in the 3D view. Next time that the triangle meshes checkbox is selected, the triangle mesh is loaded again. Display Properties: Displays properties for all the triangle meshes. List of triangle meshes: All the triangle meshes loaded in the project. Displays properties for all the triangle meshes. Color: The color of all the triangles of the triangle meshes. The color is only applied to the monochrome shader. The default color is gray. Textured: Selected by default for the 3D textured Mesh generated for the project. Not available for dragged and dropped triangle meshes. The triangles are colored with the texture file generated when generating the 3D Textured Mesh. Monochrome: The triangles are colored with a color-to-black scale that depends on an angle measured with respect to a virtual sun positioned 45 degrees from the north-east horizon. It uses the color selected above. Color: The triangles are colored with an RGB scale. The color of a triangle depends on an angle measured with respect to 3 virtual suns that have Red, Green, and Blue illumination. The color of each triangle is the combination of the light received by the three virtual suns. This shader displays a slope map if the model is viewed from above. It gives information about the orientation of each surface. Altitude (Red, Green, Blue): The triangles are colored with an RGB scale. The color of a triangle depends on the altitude of the triangle. Altitude (Topography): The triangles are colored with a default scale. The color of a triangle depends on the altitude of the triangle. Thermal: Useful for thermal project. The triangles are colored according to the channel value in the Ironbow palette. By default, the 3D Textured Mesh (if generated) is not loaded in the 3D view. If it has been generated, by selecting/unselecting the triangle mesh's checkbox, the corresponding triangle mesh is shown/hidden in the 3D view. Load Layer: Visible if the triangle mesh is not loaded, load the triangle mesh in the 3D view. Unload Layer: Visible if the triangle mesh is loaded, unload the triangle mesh from the 3D view. Export Mesh...: Allows to export a triangle mesh from the 3D view with the selected properties, in the selected formats and in the desired file path/image name. 3D Textured Mesh: Exports the 3D textured mesh. Texture: Allows to rename the texture file. By default the texture file name is project_name_texture. Tiled Texture: It tiles the texture file of the obj file. 3D PDF: If this format is selected, it is possible to select the Logo that is embedded in the 3D PDF. The logo can be imported in .jpeg or .tiff format. 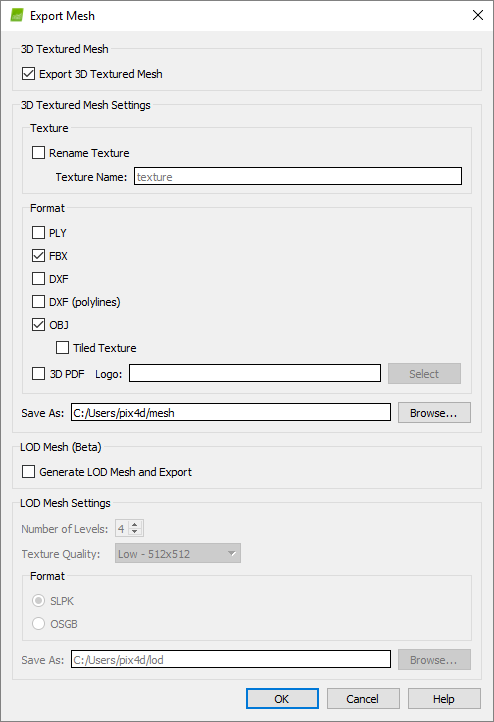 LOD Mesh (Beta): Allows to generate and export the mesh to multi-LOD (level of details) format. The LOD mesh is in Beta version. Number of Levels: Allows to define the number of different levels of details to be generated between 1 and 7. The higher the number of levels the more detailed the representation and the longer the processing time. Important: For large projects, it is possible that the LOD cannot be generated for a high number of levels as there is a maximum number of 20000 triangles that can be generated for each level of details. The two files cannot be be generated and exported at the same time. It is possible to export them separately. The SLPK file is georeferenced only when the project is georeferenced. Only the georefernced SLPK files can be opened in ArcGIS Online and ArcGIS Earth. Save As: Displays the path to the folder where the mesh is stored. By default, this is the project folder where the 3D Textured Mesh is stored after step 2. Point Cloud and Mesh. Browse...: Allows the user to select a different name for the mesh and a different path to be stored. Warning: If the exported triangle mesh is saved with the same name in the same folder where a previously generated triangle mesh already exists, the existing triangle mesh will be overwritten. OK: Saves the project and exports the selected formats with the selected parameters. Cancel: Closes the pop-up message and does not perform any action. Displays Properties: Displays properties for the corresponding triangle mesh and only applies to the corresponding triangle mesh. The same properties are available for all triangle meshes. On the left of the triangle mesh name, there is an icon indicating that the layer is a triangle mesh: .